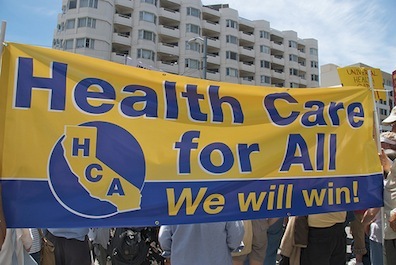 Republican members of the California Assembly created a fake and misleading health insurance website. In this wicked world of woe, there are hucksters, flimflammers, plain ol' crooks...and Republican members of the California Assembly. This last bunch of scoundrels went out of their way to monkeywrench the rollout of President Barack Obama's Affordable Care Act. This gang concocted a fake website created by California Republican lawmakers in August to look like the state's official health exchange site, where people can sign up to get coverage. When things finally got worked out on the national health care exchange in November, the Repubs mailed a pamphlet to their constituents, directing them to the decoy site, calling it a "resource guide" to "help" them navigate the ACA sign up process. However, the faux site is a trap. It's filled with boilerplate Republican propaganda against the law, gimmicks to discourage viewers from even applying for the health care they need, and a rash of distortions and outright lies. There's so much bunkum on the site that its fine print includes a disclaimer saying they don't vouch for "the quality, content, accuracy, or completeness of the information" it provides. The silliest thing about the lawmakers' blatantly political ploy is that even if it convinces some people to forego the ACA's benefits, who does that hurt? Not Obama -- but their own constituents. I know there's no IQ requirement to be a state lawmaker, but what were they thinking? We can laugh at their low comedy, but if you're a California taxpayer, congratulations: You paid for the GOP's bogus website and mailings.